Christmas Cake has its origins in 16th century England. Oliver Cromwell even banned it for a while! Of course, we have the Victorians to thank for the creative winter scenes that adorn the top of the cake. 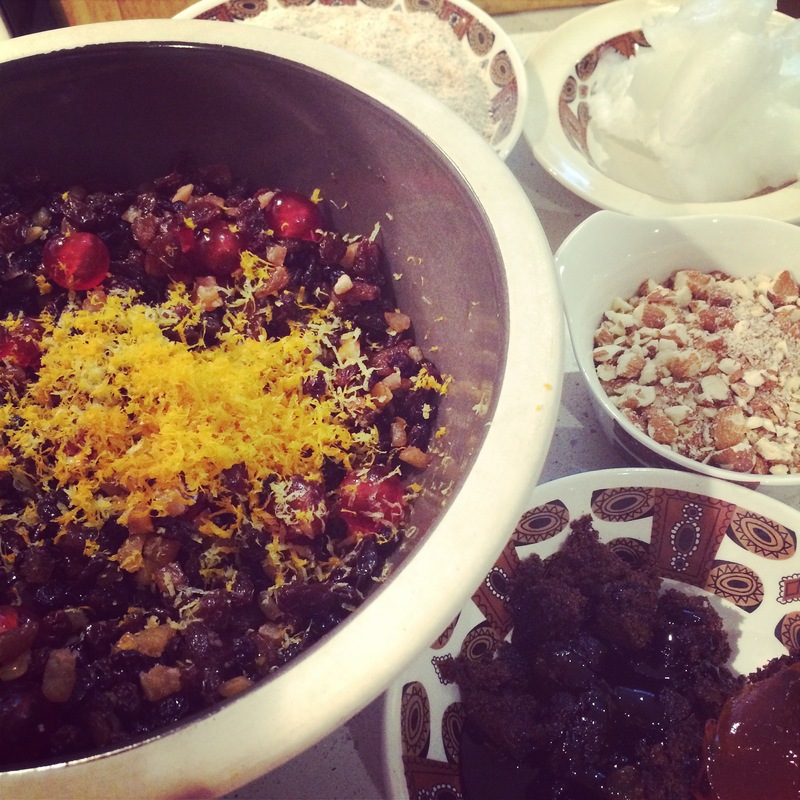 For the last many Christmases, Mr. GoodEating and I have been making our own Christmas Cake and Christmas Pudding. We bring these festive treats wherever we may be celebrating Christmas. 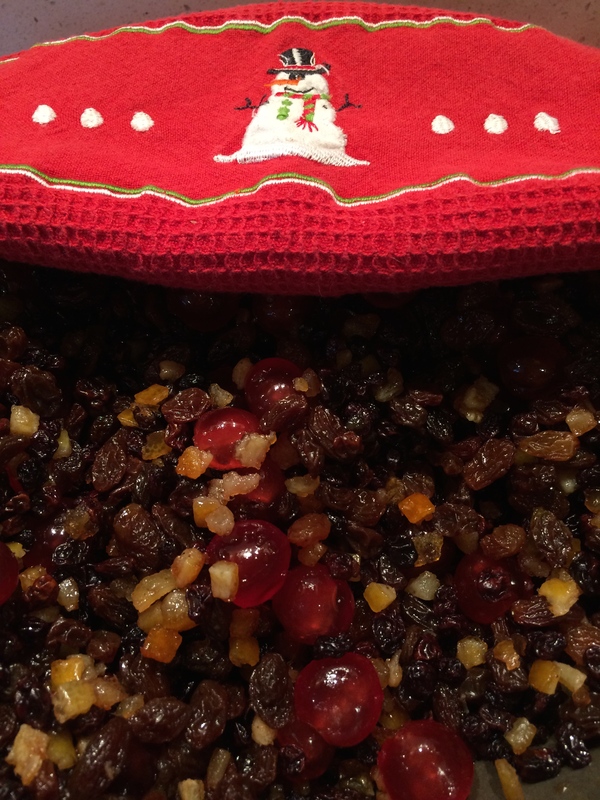 Before making ours, I never liked fruit cakes, but these… oh these are totally different and utterly delicious. They last forever, so you will be tucking into them until Spring, if there are any leftovers. Generally, we prepare ours in September or October, giving us plenty of time to “feed” the cake brandy (or cognac) and letting it mature. It can be made later, of course. Set aside 5 hours to prepare and bake the cake (and that’s apart from the time necessary for the fruits to marinate in brandy). The process itself is not complex, but there are many ingredients, several steps and long baking time. 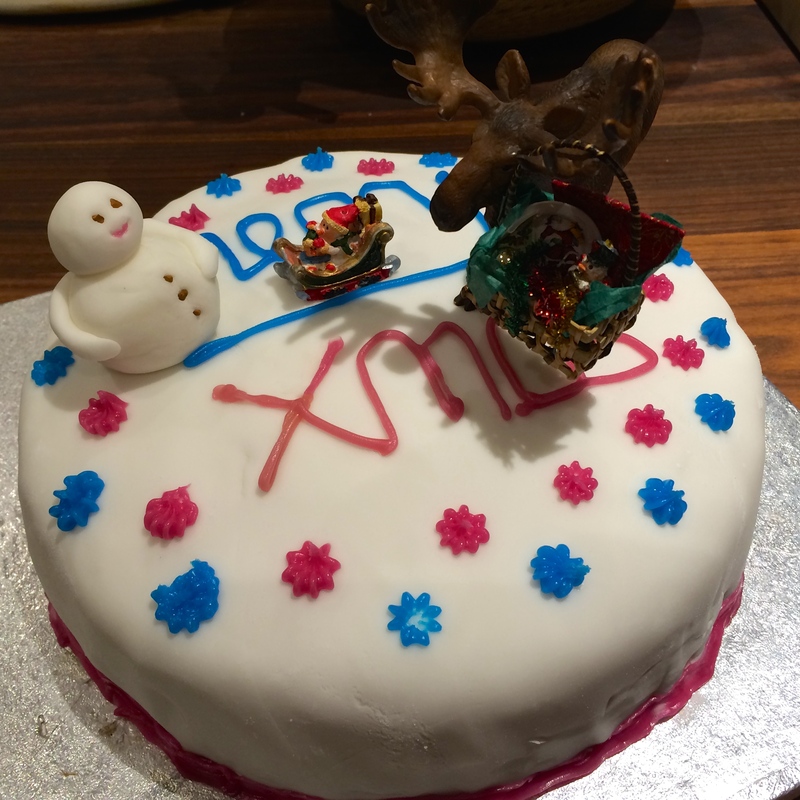 A word about our decorations: we love our Christmas Moose and the pink and blue are what happened the first time we made the cake, so now they’ve become our traditional Christmas Cake colours. And yes, beauty is in the eye of the beholder (recipe after the photo). You will need an 22cm round springform cake tin or an 18 cm square tin, greased and lined with parchment paper. Begin this cake at least 12 hours before baking (a couple of days is even better). Place all the dried fruit, mixed peel and brandy/cognac/rum or apple juice in a mixing bowl. Mix well and cover with a clean tea towel and set aside to let the fruit absorb the liquid. If more than 12 hours, then stir a few times over the intervening days. On baking day, preheat the oven to gas mark 1/275°F/140°C. Measure out all the rest of the ingredients. There are many, so tick them off as you go. Begin the cake by sifting the flour, salt and spices into a large mixing bowl. Lift the sieve up high. Do not skip this step. Airing the flour is key to good baking! In a separate large mixing bowl, whisk/cream together the coconut oil, sugar, treacle or molasses, marmalade and vanilla essence until it is well amalgamated and has lots of air bubbles in it. Next (and do this at this point, not in advance, so you do not lose any of the activated mixture), divide the soy milk into two glasses. Warm the soymilk in each glass just a little bit – warm to the touch and no more. About 10 seconds in the microwave will do. To one glass, you will add the cider vinegar and set aside, making buttermilk. To the other, you will mix in the bicarbonate. You will then take either a large measuring cup or a very tall glass and you will combine the two. You need something tall because the mixture (vinegar and bicarbonate) will chemically react and triple in size! This mixture will give the cake body. Fold in, one tablespoon at a time, the foamy mixture to the creamed coconut oil/sugar mixture. Folding helps retain the all important air bubbles. Next, fold in the flour and spices. Be gentle so that you do not lose the air. Finally, fold in the fruit, peel, chopped nuts and the grated lemon and orange zests. You are now ready to transfer the cake batter into the tin. Use a large spoon and spread it all out evenly, using the back of the spoon to help level things off. If you will not be icing the cake, then drop the blanched almonds over the top of the cake and lightly press in to stabilise them. Cover the top of the cake with a double square of parchment paper with a 50p-size hole in the centre to give the cake extra protection during the long, slow baking. Bake the cake on the lowest shelf of the oven for 2 hours and 15 minutes in a fan assisted oven or 3 hours in an oven without fan assist. In any event, check the cake at the 2 hour mark by inserting a cake tester or wooden cocktail stick to see if it comes out clean. When the tester comes out clean, turn off the oven and leave the cake in for an hour. Then, take it out, leave it in the tin, on a cooling rack until it is completely cooled. Only then remove it from the tin, but keep the baking parchment that is around the cake (you can discard the top). Once it has completely cooled (a few hours later), take it off the cooling rack and place the cake (with original parchment) on a sufficient amount of new, clean parchment paper to be able to wrap it. You will need to prepare the cake for “feeding.” Make small holes from the top of the cake all the way to the bottom. Bamboo skewers work very well for this. Make sure you are working on a smooth surface so you do not pierce the parchment paper. And now, the boozy part begins. For the first “feeding” of the cake, sprinkle 3 Tablespoons of brandy/cognac all over the top. Then, wrap the cake with the parchment paper. Tie a string around the package. Rewrap the parcel in kitchen foil. Place the whole thing in a tea towel with the ends facing the top and use the two ends to help you place the precious parcel in an airtight tin. Continue to feed it once a week. If you are making the cake in September, then you will want to reduce the amount of brandy as you get closer to December; 1-2 Tablespoons until early December will do. When you open the tin and the scent of brandy wafts over you, then you know the cake has had enough “feeding”! To decorate, place the cake on a foil board or cake plate. Dust your hands and the work surface with a little icing sugar and knead the marzipan until soft. Brush the cake all over with the warmed apricot jam and then place the marzipan on top and around the cake. If you are going to use the fondant icing, then repeat the rolling out process as you did for the marzipan, but try to extend the icing into a large disk so that you can cover the entire cake without cutting off strips. Cover the cake with a clean tea towel and then leave in a cool place for at least 24 hours. 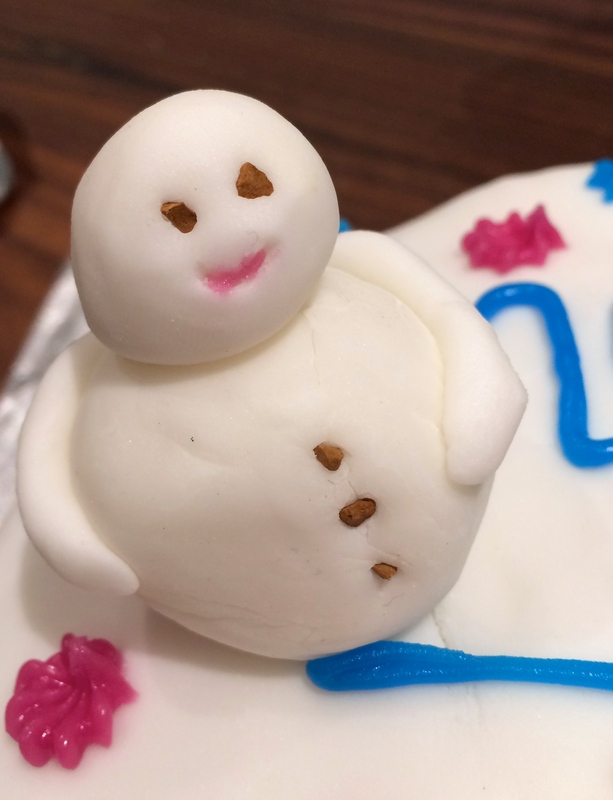 Use your imagination to top the cake with figurines, snowmen, Santas… whatever you fancy! Whether you celebrate Christmas or any other Winter holiday, do the right thing: let All beings live. 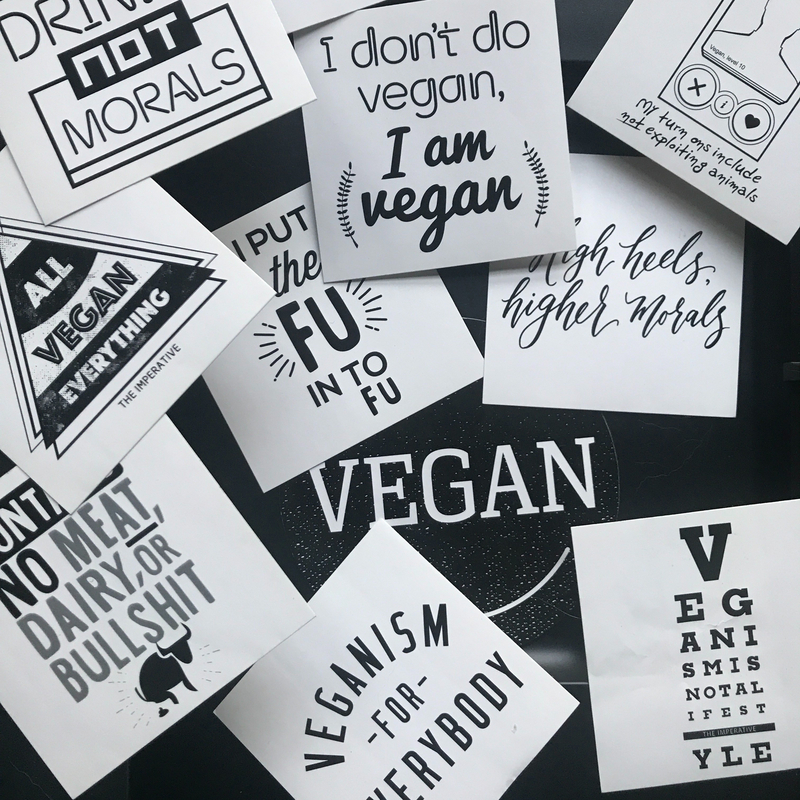 You can go vegan right now. We want peace. So let’s start with what we put on our tables. Please go vegan. First published on 26 September 2014 on this blog. Hello. I just making my 3rd cake using this recipe for my mum and dads wedding anniversary. The first time I made it it turned out lovely the second time all the coconut oil seeped out and now, the cake is currently in the oven, the oil is seeping out again. Any thoughts? Hi! Well, I’m glad it worked out the first time and I’m sorry to hear you’re having problems now. Have you followed the instructions exactly? If not, what have you modified? What kind of coconut oil have you used? Have you tried lowering the temperature on your oven? Ovens are notoriously different for each manufacturer so sometimes the culprits in baking not going perfectly. Also, have you let the cake cook all the way through even with the seepage? And if so, how did it come out? I use this recipe all the time myself – without changes – and have not had issues. Very strange about the seepage. I don’t know what the solution is or why it’s happening. I line my baking pan with baking parchment. Do you? I’m glad you like the cake despite the issue you’re having! Thanks again. If you use Instagram, I’d love to see a photo of your cake and a tag. Cheers!